Should DRA Properties be Managing the Development of Prairie Trails? Albaugh Inc. and DRA Properties have been involved in many situations related to controversial environmental issues. Prairie Trails contains a Super Fund site which is the name given to the environmental program established to address abandoned hazardous waste sites (Download Prairie Trails Super Fund Site Info). DRA Properties is working with the Iowa Department of Natural Resources to clean up its portion of the site, roughly 1,500 acres. The project manager is Dan Cook, a senior environmental specialist with Iowa's DNR. Albaugh is responsible for doing site-testing and cleaning up the site, Cook explains. Albaugh has consultants analyzing the soil and groundwater, Cook says, and the cleanup will be based on their findings. It is important to consider if DRA Properties was the best choice for administration and cleanup of this new mixed-use community. Past behavior may be a good indicator of future behavior. Please review the information below. You Decide! ● Albaugh Inc. purchases Atanor. Atanor accused of releasing toxic chemicals. ● Albaugh Inc. accused of participating in secret meetings with the EPA. During the recent construction of the Albaugh Golf Course a permit was obtained. During the subsequent construction of the Golf course many of the provisions of the permit were violated. At all times relevant to this action, DRA was the owner and/or operator of a construction site known as the Albaugh Golf Course, located at NE 36th Street & 1-35, Ankeny, Iowa (Golf Course). Construction activities occurred at the Golf Course site including clearing, grading, and excavation which disturbed five (5) or more acres of total land area . At the time of the EPA inspection DRA's SWPPP for the Briar Creek and Briar Creek South developments did not address numerous requirements contained in parts A, B, D, E and F.
Respondents' failure to develop an adequate SWPPP is a violation of DRA's General Permit, and as such, is a violation of Sections 301(a) and 402(p) of the CWA (Clean Water Act), 33 U.S.C. A. The SWPPP shall identify potential sources of pollution which may reasonably be expected to affect the quality of the storm water discharge from construction activities. B. The SWPPP must be amended whenever there is a change in design, construction, operation, maintenance, or whenever there is a change in ownership or transference of the General Permit. .
D. The SWPPP must include description of construction or waste materials expected to be stored on site with information regarding controls used to reduce pollutants from these materials. E. The SWPPP shall identify and ensure the implementation of appropriate pollution prevention measures for non-storm water discharges. F. The SWPPP must include certifications signed by all contractors and subcontractors executing measures described in the SWPPP. 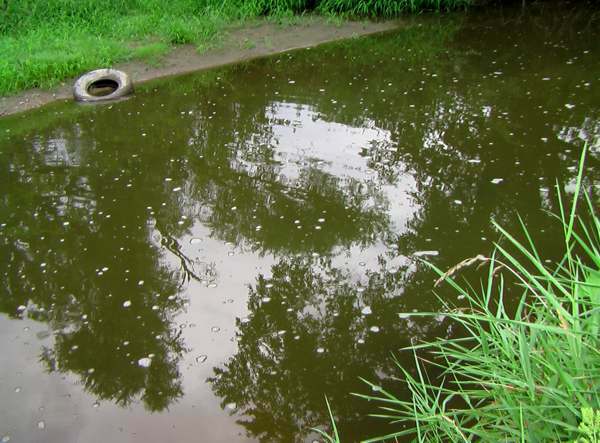 At the time of the IDNR inspection DRA had an improperly designed sedimentation basin and had not installed silt fencing along Otter Creek and in the area that drains the northern 25 acres of the Albaugh Golf Course. At the time of the EPA inspection DRA had not installed silt fencing around two storm water inlets located near 36th St. in the Renaissance Villas portion of the Briar Creek site as required by the SWPPP. At the time of the EPA inspection DRA and MJ had not installed any silt fencing along the southern boundary of the Briar Creek South development as required by the SWPPP. At the time of the EPA inspection DRA had not installed portions of silt fencing along segments of the eastern boundary of the Briar Creek development as required by the SWPPP. DRA and MJ had not installed portions of silt fencing along the eastern boundary and Briar Creek South development as required by the SWPPP. At the time of the EPA inspection DRA had not installed mechanisms to protect the storm drain inlets at the Renaissance Villas and Briar Creek developments. DRA and MJ had not installed storm drain inlet protection at the Briar Creek South development. At the time of the EPA inspection referenced in paragraph 24 above, track-out of sediment was observed at the Briar Creek and Briar Creek South developments. DRA failed to install appropriate controls to minimize off-site tracking of sediments at the Briar Creek site. DRA and MJ failed to install appropriate controls to minimize off-site tracking of sediments at the Briar Creek South site. DRA's General Permit requires that DRA shall at all times properly operate and maintain all facilities and systems of treatment and control which are used to achieve compliance with the terms of the General Permit and the SWPPP. As owner andlor operator of Briar Creek South, MJ is responsible for compliance with DRA's General Permit along with DRA. At the time of the EPA inspection DRA had not adequately maintained silt fences at the Albaugh Golf Course and Briar Creek developments. DRA and MJ had not adequately maintained silt fences at the Briar Creek South development. The EPA inspection found that DRA did not perform and document weekly site inspections during construction which occurred after seeding on the Briar Creek site. Both DRA and MJ Properties failed to perform and document weekly site inspections during construction which occurred after seeding on the Briar Creek South site. Albaugh Inc. purchased a controlling share of Atanor in 1997. Atanor has been involved in numerous controversies concerning the release of toxic substances. The laboratory results were alarming, indicating the presence of heavy metals and organic contaminants such as the pesticide DDT and other deadly chemicals, like HCH (the chemical from which the pesticide Lindane is obtained), chlorobenzene, and the pesticide 2,4-dichlorphenol. The environmental and health impacts of these chemicals are very well documented and they include death of plants and fish, low fertility rate, reproductive system disorders, immune system changes and cancer. These harmful pollutants could last a long time in the environment, they accumulate in the fat tissue of animals, contaminate food and are passed from mother to child in the womb and through mothers' milk. These persistent poisons are know as Persistent Organic Pollutants (POPs). The Atanor plant manufactures chlorinated pesticides and is based in the river complex Matanza-Riachuelo, a severely contaminated waterway and well known polluted "hot-spot" in Argentina. The company was privatized in the 1980s. In March 1997, Albaugh Inc. of Ankeny Iowa bought 51 % of Atanor for $58.5 million. Dennis Albaugh, president of the company, was quoted as saying "This will enable us to bring a lot of new products into the United States." Over 6.5 million pounds of the pesticide 2,4-D were shipped to the U.S. in the last 12 months. "Atanor is just another example of a global polluter. Their toxic discharges poison people here and around the planet as these contaminants travel around the globe. This irresponsible practice must come to an end", said Marcelo Furtado of Greenpeace International. In 1998 FUNAM (gave notice) noticed to the public of a serious accident at Atanor’s petrochemical factory in Rio Tercero city. Even if (apparently) two or more cells exploded releasing toxic gases, the accident remained hidden. In 1998. Move against the chemical companies “Atanor” and “Petroquimica for not having compensated a family affected by the spilling of their industrial waste (Rio Tercero, Cordoba). After a Judicial process the Court condemned both companies to compensate the family. Even if the court verdict continues to hold firm such family never received the compensation. This move continues. IN 2001 a move against the Environment Agency of Cordoba for not having controlled discharges of dioxins and furans among incineration plants. Such case was presented at the Anti Corruption Office. The presentation of FUNAM involves three plants: CIVA in Villa Allende, Atanor in Rio Tercero and Minetti-Holderbank in Malagueño. Documents obtained under the Freedom of Information Act and other sources reveal that the task force, made up solely of 14 agro-chemical companies with no public interest representatives, has met regularly with EPA officials in secret and has urged the agency to write new pesticide regulations that would eliminate expert oversight over species protections. The Federal Advisory Committee Act prohibits the federal government from obtaining advice from committees comprised of only the regulated industry. That act also requires that the meetings of advisory groups be open to the public. As of March 2003, the companies on the FIFRA Endangered Species Task Force were: Albaugh, Inc., Aventis, BASF Corp, Bayer CropScience, Dow AgroSciences, LLC, DuPont Ag Products, FMC Corp., ISK Biosciences Corporation, Monsanto Co., Nissan Chemical Industries Ltd, Nufarm Inc., Syngenta, Uniroyal Chemical Co., and Valent USA Corp. The lawsuit complains that the EPA has not chartered the Task Force under the Federal Advisory Committee Act, has not ensured that Task Force meetings are open to the public, has not made Task Force records available for public inspection, or kept public minutes of Task Force proceedings, or ensured that the Task Force is “fairly balanced in terms of the points of view represented,” as the act requires. "For years, EPA has flouted its obligation to protect endangered species from pesticides," said Aaron Colangelo of Natural Resources Defense Council. "Now that the courts are directing EPA to comply with its duties, the pesticide industry and the Bush administration have come up with a new trick for delaying species protections." Full Article Here. Please Scroll Down to the 5th article.